It is not often I am floored. The concept of taking a role playing game, removing, what most people consider to be the lynch pin (the dungeon master) and making it work seems fraught with danger, perils, and sheer idiocy. Yet, here I sit, on the floor... floored. Mike Selinker, who may be one of the nicest designers we've had the pleasure of meeting, and his team have put together a game for the ages. 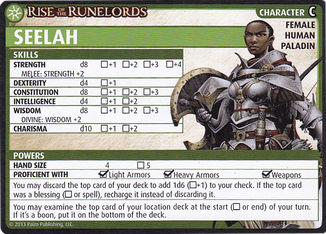 Pathfinder, one of the most beloved role playing games of all times, is now playable in card form, sans said DM. I dare you not to like this game. I double dog dare you not to like this game. Even if you don't like role playing games, the sheer mechanics they've been able to pull off are astounding. Venture forth dear hero... loot awaits you! 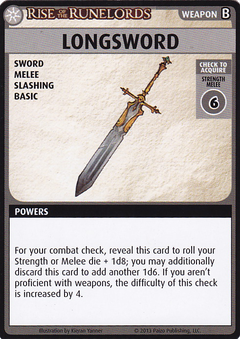 Removing the DM, is exactly what the Pathfinder Adventure Card Game (PACG) does, and does remarkably well. While some people have complained about set up for the game, after understanding the interactions of the location decks and different types of cards, even large games can be set up in as quickly as 10 to 15 minutes. The base set, which sells for $59.99 retail, comes with over 500 cards and several different archetype classes we are all familiar with. There's a bard, a rogue, a paladin, all the usual suspects. There's spells, there's weapons, there's monsters, and villains, and around every corner, more new items to find and use! I've decided that since this is such a completely new style of game, I'm going to be calling it a Deck Evolution Game. You start with 15 basic cards, which you can make up on your own, using the Basic trait listed on cards, or use pre-constructed decks suggested in the awesome rulebook. From there, you choose to set out on a scenario, adventure or adventure path. Scenarios are a single session, with Adventures being a series of scenarios and Adventure Path's being a series of Adventures. This offers a massive amount of flexibility and replay value as you not only have a seemingly endless supply of journeys in the base box, but replaying them, and replaying them with different characters will lead to new experiences every time. Each character has a stat card, showing you starting hand size, skills, and powers, as well as having room to acquire new powers. Don't worry though, if you aren't the kind to mark up your cards, Paizo has a tremendous set of downloadable files you can use instead, and write on, doodle on, or whatever-on as you see fit. From there, it's setting up your location decks, as listed on the scenario you are playing. It's as easy as pulling random cards from the box of each type listed, building a deck of about 9 cards, adding a villain or henchman and knowing some basic information, and getting ready to explore! 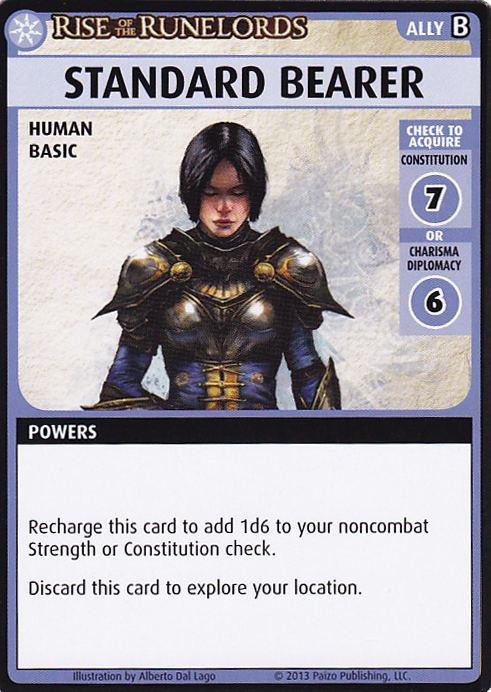 Exploring is the primary action, as it'll uncover the top card of the location your character is at, and allow you to engage in a fight to eliminate monsters and potentially find the big bad guy in the scenario, or find wondrous items, weapons and armor to acquire for this and future fights. This is where the "Evolution" part kicks in. You both will acquire cards to use in this setting, but also then, in between games, be able to use the found cards to "remake" your deck, as well as help your fellow heroes by trading cards with them. So while a bard may explore and find a sorcerer’s staff, they may very well want to acquire it and ensure their party members grab some phat loot! Aside from items and weapons, armor and spells, there are also Blessings and Allies. allies will assist you in your adventures by helping you complete checks of certain types, but also allow you to continue exploring. Each turn, heroes can explore once, or in other words, look at only one of the top cards of their location decks. With allies and blessings, they can do it more than once per turn. Beware though... those 15 cards you started the game with, that's all you'll ever have, aside from the cards you may acquire in your journey, and if you can't draw when you need to, you die. Yes, you can die in this game. It is advised to not do so, so we suggest playing smart and not reckless, you and your party will be thankful. Blessings are the final major component, as they have the ability to help you with checks, press on with exploring, and also, act as a timer. Each game, no matter the number of players, will see you make a set of 30 random blessings as a timer deck. Each turn, the first action is flipping a blessing. When you can't, you lose. This sounds harsh, as with 6 players, that seems to mean fewer actions per player, but it scales amazingly well, given all the player's capabilities and character's powers. There are many opportunities to interact with the Blessing's Deck, in both positive and negative manners, but this is a well designed mechanic in the game. Around every corner is the potential to gain awesome cards to assist you or be cornered by beasts, monsters, villains, and their henchmen. Couple the excitement of exploring a bit randomly with the timer of the Blessing's deck and things heat up quickly. Each Scenario, Adventure, and Adventure Path has rewards for heroes who succeed. Some allow for new items or gear while others allow you to evolve your character and up level their skills and gain new powers, or even, roles. The character development and the subsequent experience that happens as a result is where the meat and potatoes of this game lie though. It is in the experience of building your character over multiple sessions that the true value of the game comes out. The joy of soloing an adventure to gain a new item, the thrill of adventuring with friends and gaining a new skill, or the excitement of a giant adventure path with many heroes and being rewarded with loot makes for both an a amazing card game experience, and a rewarding role playing experience for any type of gamer; role player or not. We have completely enjoyed the Pathfinder Adventure Card Game. Mike and his team should be applauded for tackling a task some deemed impossible and exceeding in every manner possible. This is without a doubt a Crit of a game. Whether you are an experienced RPG'er looking for a new experience (pardon the pun) or a newcomer to the world of Pathfinder, there is SO much to explore and SO much to enjoy inside the PACG, you'll be adventuring for many game sessions to come! Finally, Mike was kind enough to grant myself and Tim Norris, from Grey Elephant Gaming, some time at Gen Con 2013 this year, to talk the game, his inspiratoins, and his vision for what's next. Enjoy brave hero... now go forth and venture! 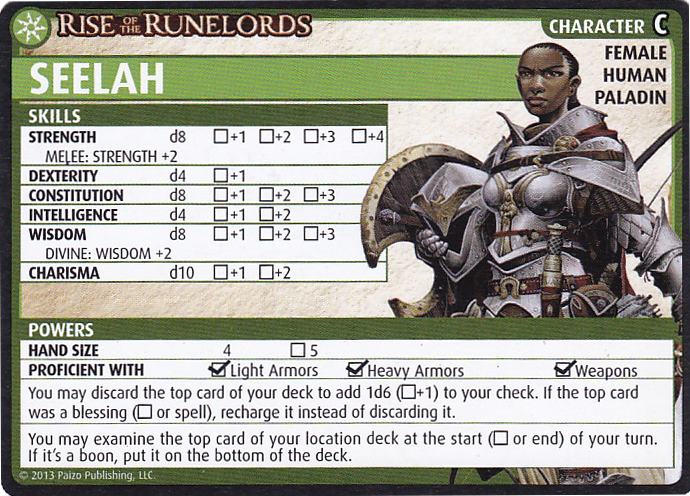 Pathfinder Adventure Card Game: Crit, Hit or Miss? I've been eyeing this game ever since Rodney reviewed it a few months ago on "WatchItPlayed". I will probably not be able to sleep tonight, due to me wanting this game and thinking of playing it! Another wonderful review Tox! I'll have to save up for this one and put it on the top of my list. Was wondering, how does this one fares compared say to Descent? Similarities? Differences? Love your coverage of this game though :P (And I agree with you, the art lis fine!) It certainly is on my radar, but am wondering if I should get this one or the Descent 2.0... Tox, having played both, any insight on this matter? Thanks again! Whelp, I preordered it on Coolstuffinc! I sure hope it does arrive at Coolstuffinc tomorrow! <crosses fingers> Thanks again Tox for taking the time to play and explain the game! Wow, great question Whiterabbit! They both provide SUCH a different experience. If I wanted a more traditional dungeon delve, I'd do Descent, it's one of my favorites. If I wanted something new and different, or had a good RPG base, I'd do Pathfinder. That help? Doesnt help you much either right? For a Campaign,, which one would be the most fullfilling one? And what about a single play session? Any more investment that need be done timewise to get a good experience from either? Maybe these questions can help you a bit on how to compare these? Hey Tox, just wanted to voice my love of this review, especially the play through! I would support you if you started a series of lets plays through an adventure path of this game, just hearing your reactions and thought on how to precede is excellent (or even the same thing but with Descent). I also have seen your Descent review, and I wonder which you think is the better game if you were mostly going to play solo? I have already bought PACG but if you said Descent might be a better solo game, or if it's certainly worth it to own both for solo play, I would probly try to pick Descent up too. Thanks Silentdante, glad you enjoyed it. Part III will be online tonight, so the finale isn't too far off. I'm actually working on a blog entry for a solo play through with Sajan, in a story style. We'll see how that's received, but I'm having fun with it so I hope everyone else will as well. For me, Descent, while I LOVE it, is HARD solo. This has everything on the cards, so if you forget something, it's right in front of you. I would choose this for solo comparisons, for my tastes. Hope that helps. Thanks for watching and commenting! Whiterabbit, It's a tough call. Right now, if I was stranded on a desert island with no hope of rescue, I'd want Pathfinder with me. Tox, you are my hero. I have never sleeved many of my games and I even ruined the Duke during GenCon this year. I sleeved this game and you inspired me to do so. Tox made me buy Mage wars a couple monts ago and it's now a crit for me and my board game partners. I'm looking at this one and I'm pretty sure he Will be right Again this Time. Keep up the good work ! Your job is amazing and it's cool to see how passionate you are when you talk about board gaming. The fun you got With this game is really contagious. Hope I Will have the chance to play it soon. Darsene, thanks, I'm glad you've enjoyed Mage Wars. Hope you, and your group, like this as well! Great review and I learned some rules watching your videos. Was it correct though to use your shield to reduce acid damage? Hi Owen, thanks, I'm glad you enjoyed it. No, it was incorrect. Damage from Black Fang's acid attack is not considered "combat damage". Hope that helps. This review influenced me to purchase this game and I must say that this is, hands down, one of the best, of not the best table top game I have ever played. First of all, I am new to Table top RPGs and I absolutely love them. I play pathfinder and 3rd Ed warhammer fantasy roleplay. Anyone who plays RPGs knows that a board or card game will never match the depth of an RPG. 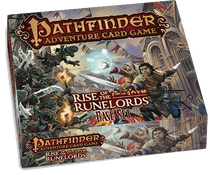 Wjat is amazing here is that Pathfinder Adventure Card game features a massive variety of some of the best features of a good RPG and brings it down to a card game that you can play solo or with friends. I have several games under my belt now and I am so impressed with how much fun my gaming group and I are having running the Rise of the Runelords campaign. I find myself becoming connected to my hero much like I do when playing the RPG. I dread the day my Fighter dies (and I hope it isn't like. 6 months into this ever expanding game!). This game is simply amazing and it deserves a place in everyone's fame shelf. Awesome to hear you are enjoying it so much Bowflexman! Hope the journeys continue to be exciting! We're still loving ours! Very fair, very thorough review. I'm looking forward to watching part 2. I bought this game with the intention of playing it solo only and it looks like it will play well. Your review was very helpful because it cleared up some ambiguities in the rules. My only disagreement with you is that I think the rule book is poorly organized compared to the rulesbooks I encounter in the many (100s!) of board wargames I have played. I've had to look in some unexpected places to get information and even then it was ambiguous and it's taken me a lot of time. However, I think I'm ready to go now . . . .
Great video! I just picked up the game yesterday and absolutely love it! I didn't see it in the questions before me so I hope I'm not repeating haha, but the rules and card wording confused me a little on the checks. When you fought Black Fang the first time you used Goblin Sneeze. The card says "For your combat check" and then says roll "Divinity". You rolled your divinity check and got 6+3= 9. This would allow you add the +2 you get for Seelah correct? Since the check should change from the normal Str/Melee to a different skill. I want to make sure I wasn't playing it wrong before with other cards as this would lower the damage you took from 3 to 1 which is huge if you didn't have the plate armor. Thanks for any help and awesome video as usual. Thanks Bill, glad you enjoyed it. Yes, from time to time, doing everything as a "one man band" there are some play errors. As you described it, it sounds correct and since Seelah has Divine: Wisdom +2.